The Bangalore Restaurant Guide and Book Reccommendations have been updated. Remember little Anand, the 2 year old who Smile Train operated on in October to repair his hair lip (see Jan. 11, 2011 “This Will Make You Smile”)? A very sad update to report that little Anand died recently in hospital from pneumonia. Our OWC charity member who arranged the operation saw Anand ten days before and he was fine, he had put on weight and was walking. Such a sad ending but we know he was well loved and well taken care in his short life at one of the OWC charities. With just under two months left in India things are winding down. We’ve booked our flights out of here on the same day our visas expire and the moving process has begun; we’ve had two companies come through to estimate how much stuff we have to send back to Canada. We are going back with little more than what we came with but both companies estimated five times the amount. That’s a huge difference and means the difference between shipping by air (2-3 weeks) and sea (2-3 months). Something fishy going on there. My charity work is almost done and I’ve handed off my four charities to other committee members. It was another productive year with a big increase in funds raised over the year which meant that we had a lot more to distribute to our 25 charities. After many meetings and emails we have distributed the funds to many, many worthy projects. I have written my last article for the Rangoli also. I think I managed to write an article in almost all but three issues since I joined. Really enjoyed writing for the magazine. Yoga – I’ve cut back to just taking the Iyengar class 2-3 times/week. I still love it and the other days I’m doing yoga at home. I definitely want to focus on Iyengar when I get back to Canada and looking forward to finding a good studio or teacher. Definitely one of the best things I have learned in India! My last post was all about corruption. But then I spent 3 1/2 hours at a charity meeting – discussing ways to fund 25 charities where it is clear that the people running them give, give, give. Give of their time and give of their money. They really devote their entire lives to whatever their cause is – whether it be sending slum children to school, picking vagrant women up off the street, or integrating blind children into the mainstream. Too many causes to list and there are millions in India alone who have started charities like these. So, where there is corruption there is also good. India must balance out the corruptors and the givers…and then good must overtake evil…sounds like a superhero is needed to make this country work! 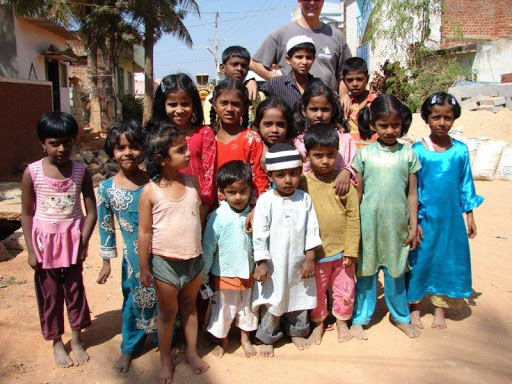 After living in India for 19 months I think I’m finally feeling settled. I thought I was settled after six weeks but now I don’t think so. I was in the “adventure” stage for the first year. Everything was new and exciting. Then things started to get a bit frustrating. And now, as long as nothing major happens I just feel like this is normal. Maybe I’m kidding myself, is that really true – what is “normal” in India? I guess I’m more into a “normal” routine now than ever before. I’m kind of focused on two things right now and they are taking up most of my time: yoga and charities. I go to yoga five or six times a week now and I feel like I am really improving. My Iyengar teacher has three classes a week (1 ½ hrs) and then I usually go to the Ashtanga class (1 hr) three times a week. I am learning a lot in the Iyengar class and always feel challenged. The Ashtanga class is quite repetitive doing a few asanas, 20 sun salutations and about 15 min. of pranayama. The thing is – it’s not like going to the gym – it doesn’t feel like work. It is tough and strengthens the body – I’m doing handstands and headstands and all sorts of twists – muscles strengthen and stretch in a good way. I’ve never found anything else that I would want to do six days in a row. The charity committee is taking up more time now as all 25 charities have submitted their applications for this year. I’ve had to meet with each of the four that I am responsible for and go over all the paperwork, collect receipts from last year and make sure last year’s project is complete. We also have to check financial statements and tomorrow the committee will meet and start deciding what we will fund this year. So that’s what’s been happening lately but of course the routine will get a good shake up soon – a friend of mine is coming to town for two weeks; cooking class in Goa; Craig goes to Leadership Camp; another photo competition…and of course more yoga and charity work. 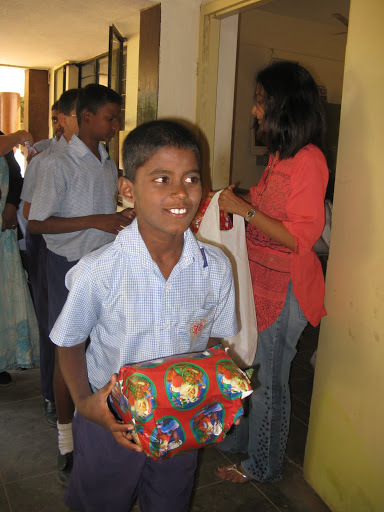 Just got back from delivering Christmas gifts to the women at Vision India. Just a super experience, the way their faces lit up when they saw us…and then to receive a gift – wow! Vision India literally picks women up off the street – homeless, many are mentally challenged, some are pregnant, some have broken bones. 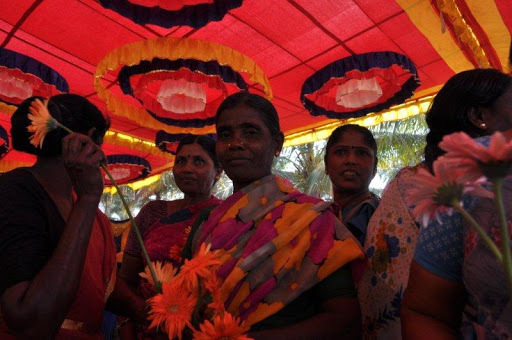 They give them food, shelter and arrange for health care and psychological care. Their goal is to rehabilitate them, find their families, educate them about the women’s problem and hopefully send them home. It is a very basic place – no beds, very little furniture or facilities. I am always amazed at the dedication of the people who run these places – they truly give their lives to their cause. Earlier in the week about 20 of us got together to wrap presents for four different charities. We wrapped blankets, dresses, sweaters, towels, jeans, watches and more – many for children, depending on their needs. And then we added a bar of chocolate as a treat. Definitely a good way to get into the holiday spirit…of giving. This build was in the same area as last time but they worked on at least 13 houses. One day I worked on house #13. It was hot and it was heavy work. 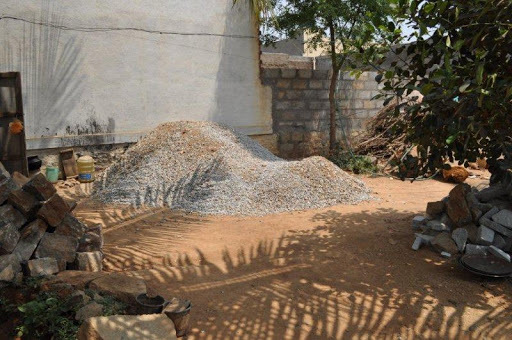 A truck pulled up and dumped a pile of “jelly stones” outside the gate of the house…so we moved them inside the gate. 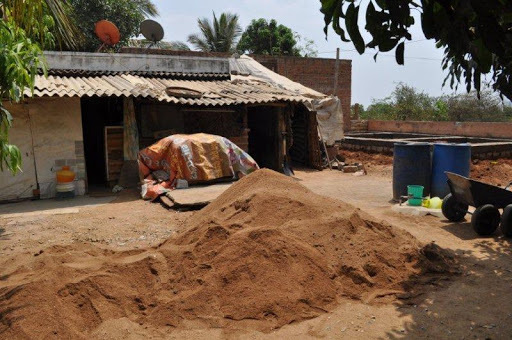 Then a truck pulled up and dumped a pile of sand outside the gate…so we moved it inside the gate. 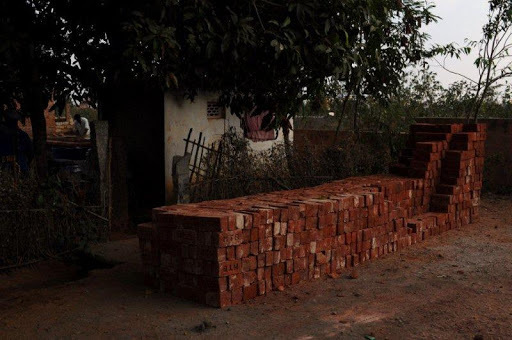 When we came back from lunch a huge truck had pulled up filled with bricks – you guessed it – we moved them inside the gate. This picture was taken after we moved half of them. 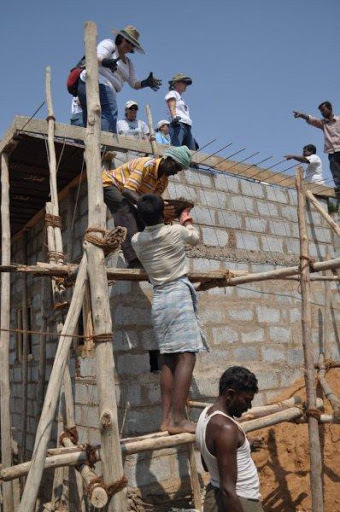 The construction of one of the houses was complete and we had a “dedication ceremony.” At the end everyone touched the house and said a prayer. 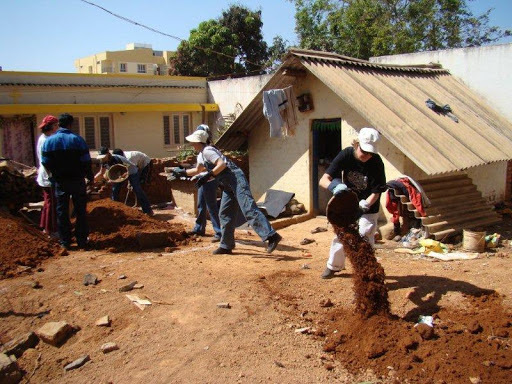 The build is ongoing and so I hope I’ll have an opportunity to go out and help again. The people of the village work alongside us and there is mutual respect. We learn from each other. Where to start? The Olympics are over so I have a lot more time…to sleep. I fell down the marble stairs just before the GOLD medal hockey game. It was 1:45a.m. our time. I dropped the laptop and fell back right onto my elbows. Although I am bruised and sore, the laptop is fine and I did make it to the couch in time for the opening face off. I started doing yoga and I really like it. It is excellent for balance and toning up the muscles. 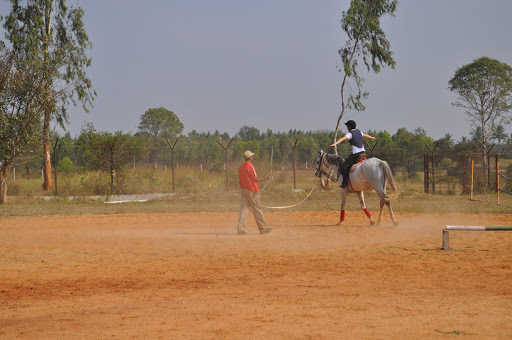 My instructor is Israeli – which is kind of weird since I’m in India – but she is good and tough. Never say “I can’t” and don’t admit that you do other sports or go to the gym – she only believes in yoga. Only four to a class and it’s in her home, which is close to mine so it is convenient – especially since class starts at 8:00am! I continue to write articles for the OWC Rangoli magazine every month. Usually I write one travel article and one article on a OWC social event and provide photos as well. OWC Charity work has kept me busy since the new year. We have been accepting grant applications from our 28 charities. The committe reviews each application and decides if we can fund everything they have asked for, or a portion. We are very thorough and make sure all money given out is for legitimate needs. Next week we go before the OWC Executive Committee with our recommendations and hopefully everything is approved. Then, by the end of the month we will deliver cheques to each charity. 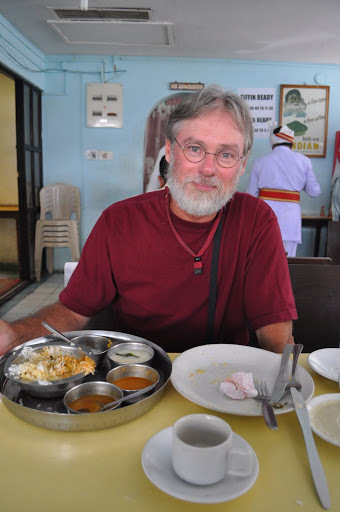 My brother Steve visited India for three weeks. It is sure nice to have people visit us. Bangalore is not the most eventful place for visitors but I think he got a taste of India and liked it. We walked around our neighbourhood and came upon a wedding at the local temple one night. He and Michael went for bike rides through the villages and out to the farm land. We went down to Commercial Street of course. We went to an area that I hadn’t been to before – very Muslim where there were not only sari bazaars but Burka bazaars. Steve and I went to Sai Babas ashram just to look around. Baba was not there, he was still at his main ashram in Brindavana. There was a man in the book store who was so adamant that Steve go visit Sai Baba in Brindavana, even though Steve was leaving India the next night. The guy kept saying, “Go now, get a taxi, you’ll be there in six hours. You’ll see Sai Baba in the morning and come back in time for your flight.” He was serious. I think if I was Steve I would have gone, it was like he had some inner knowledge. Steve and I went to Nrityagram dance village and even to an OWC cooking class at an Italian restaurant. Please, please if you see Steve ask him to make Hot Chocolate Souffle – he’s got the recipe and he even took notes during the class. I’m sure he can’t wait to make it! The kids are doing well at school. Alanna has been horseback riding at school three times a week since Jan. and she loves it. Her school had an evening of music and dance and she performed with her ballet group. She is working on a play and she’s made some good friends. Alanna seems to be adjusting better – although she won’t admit it. She still misses her friends back home of course but she is doing well at school and keeping her marks up. Craig is still enjoying going out to play with his friends. They like to bike or play tag or basketball. He is enjoying basketball at school as well as karate and other sports. Craig went on a two night/three day leadership camp with school and Alanna goes next week – Sunday to Saturday. She says she’s not looking forward to it, but she’s already packing. Michael is busy at work, and enjoys biking around the area. He’ll be travelling a bit more before we head to the Andaman Islands for spring break. We all enjoy the pool, especially now that summer is here and it is so hot. Fans and A/C are getting used a lot more nowadays. So, everyone is busy in their own way and always a little more settled and feeling a little more normal here in India. The traffic doesn’t seem as bad, the grocery shopping easier, the food is good and weather – couldn’t be better! 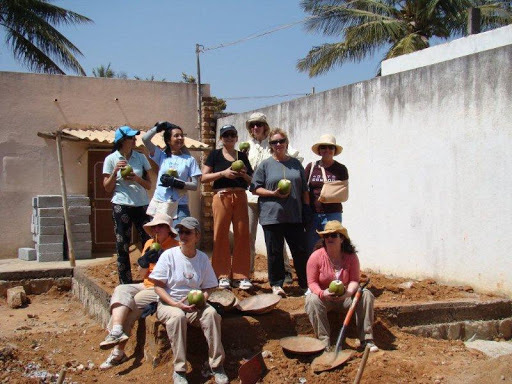 Last Saturday the Overseas Women’s Club organized a BUILD with Habitat for Humanity. 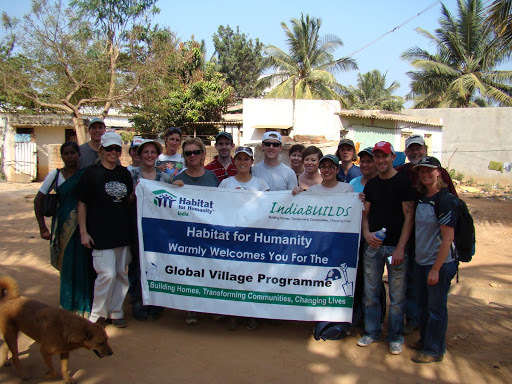 HFH is an international organization that I’ve heard of many times, so I was thrilled to be able to volunteer for a day and help build houses with local Indian families. Michael wanted to join in and help and so did my brother Steve who is visiting for a couple weeks. So we put on our work boots and work gloves and drove to north Bangalore. We weren’t really given an address, just the village. Our only indication that we were in the right place was when we saw a bunch of white women standing on the side of the road. Twenty-eight women and family members came together to volunteer their time, strength and camaraderie. 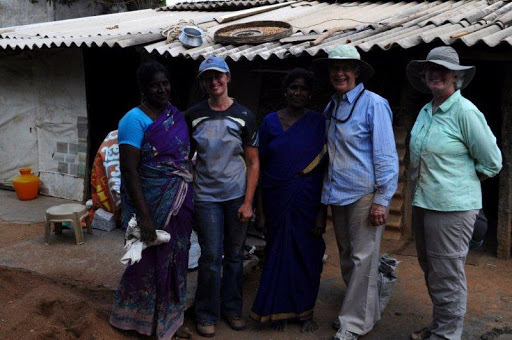 We were greeted by Nirmala and the Habitat team who explained the goals and ideals behind Habitat for Humanity, the work they do worldwide, and in India. 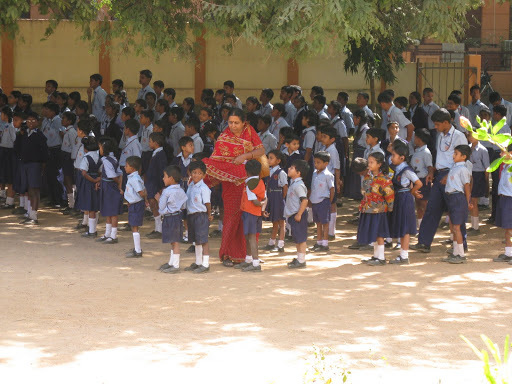 Nirmala asked us to form four groups and each group set off to work on a different home. Actually, she singled out the guys and told them to form the “digging” group. There may have been a little good-hearted grumbling (something about sexism) but they set off to their worksite with picks and shovels in hand. Each of the four homes were at different stages and everyone worked hard digging, hauling dirt or cement, or laying bricks. 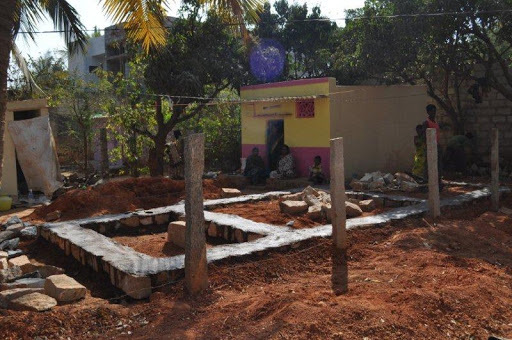 The home owners worked alongside of us and it was rewarding to work with each other and see the progress over the day. During our lunch break Nirmala had some words of wisdom. She acknowledged that each of us could easily have paid a local 200Rp to do the work that we did. But she assured us that our time was as valuable to the community as our labour was. 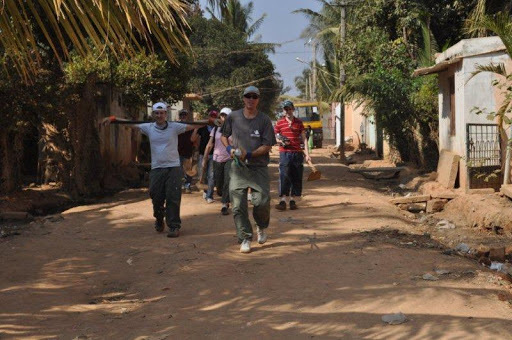 It showed the community that we valued them as people and cared enough to come and help. Not only that but each of us will share our experience with others and create awareness. 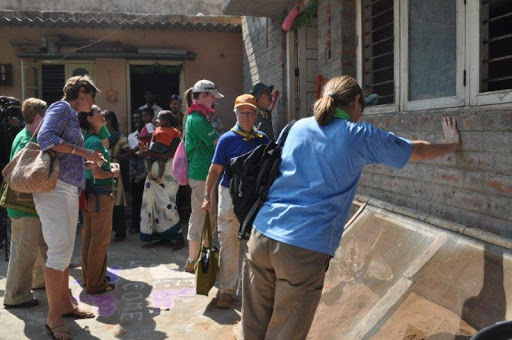 The teams bonded with each other, interacted with the homeowners and the curious local children. Everyone was eager to help out and it was hard to say goodbye. 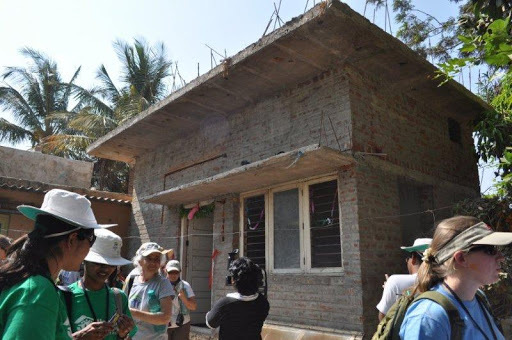 At the end of the day, we were all enriched by the experience organized by Habitat for Humanity and the Overseas Women’s Group. The children wear uniforms (including shoes). They lined up after lunch and we gave each of them wrapped gifts: a chocolate bar, a lunch bag and a water bottle. The children were very appreciative and tried their best to say “thank you” and gave us a big smile. I had to remember to make eye contact and say “your welcome” to each one since they can lip read. We saw the library after that and it was stalked with quite a few books. 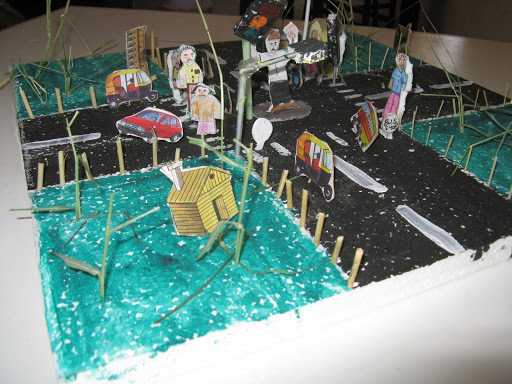 We were really impressed by some of the artwork the kids had put together – 3D roadways and parks with cars and people and rickshaws. 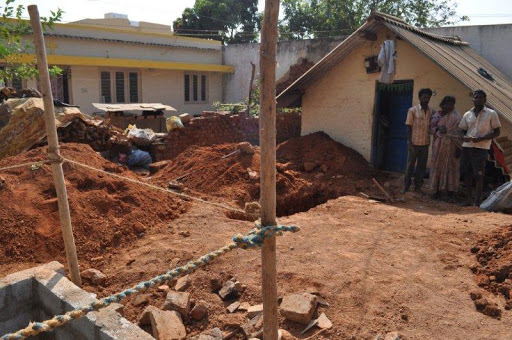 The second charity, Asha Niketan, is a home and vocational center for mentally challenged men and women. They are taught to take care of themselves and learn skills. The OWC provides wax for candlemaking which they are able to sell. As well, we pay for dance lessons and while we were there they did some dancing for us. It is very therapeutic and enjoyable for them – they were having a good time. We gave out gifts to about 25 people while we were there.